Share this product and receive a $0.24 sharing discount. A boy and his grandfather come face to face with their own mortality within a tomb of snow. Reliance upon God is their only option as escape is impossible. But the story does not hinge upon the question of their rescue; what captivates is the response that each has to the circumstances that God has placed them in. When death is a constant companion, how does one view life? The ebb and flow of emotions are captivating as the boy and his grandfather fight off predators and the terror produced by the uncertainties of their snowy grave. 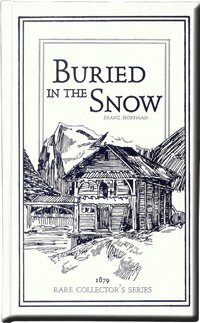 I know of no other book that so delicately prepares children to face the death of a loved one than Buried in the Snow. When a story is as emotional as Buried in the Snow, it is very difficult to read it aloud. On the day we finished the book, I had to pause at least three times to catch my breath. From Mack Waller of Patterson, Missouri on 1/12/2019 . Great story, loved the old English, but some parts are a little bit unrealistic.